Winter may have taken a long time to get here this season but now it looks like it’s settling in across most of the country and it’s not going anywhere soon. For many Newfie’s, cold and snow are what they’ve been waiting and winter is THEIR season. While their humans and other furry friends are seeking shelter inside, Newfie’s are hunkering down in the biggest snow pile that they can and ignoring the pleas of their owners to come inside where it’s warm. Just the other day I headed out for a walk with Leroy. It was cold but not dangerously cold and I was dressed in my warmest winter dog walking gear. A little less than halfway through the walk, I decided it was too cold for me so I told Leroy it was time to head back home. He gave me an evil sided eye glance and reluctantly turned around and sulked back home. This is life with a Newfie in winter. I’m a freeze baby. Sherman and Leroy are never going to be as cold as me. We love to see Newfies in their happy place in the snow so that’s why we rounded up some of our favorite snow pictures so far this season on Instagram. A winter storm knocked out the power but Dudley doesn’t see an issue with that. That just means the house is going to be the perfect temp! Napoleon is loving his first snow! Frisbee+snow = Best. Day. EVER. Ranger and Bentley live in New Jersey and they’re snow experts. Winnie loves the Vermont snow life! Do I have something on my face? Does it look like Thunder Bumble wants to come inside? What’s more relaxing than watching the flakes fall? Who needs snow when you have a beautiful coating of ice? We know that many parts of the country will be experiencing bone-chilling temperatures this week and we hope that everyone stays safe and warm, Newfies included! If you question if the weather is too cold for your Newf, bring them in. 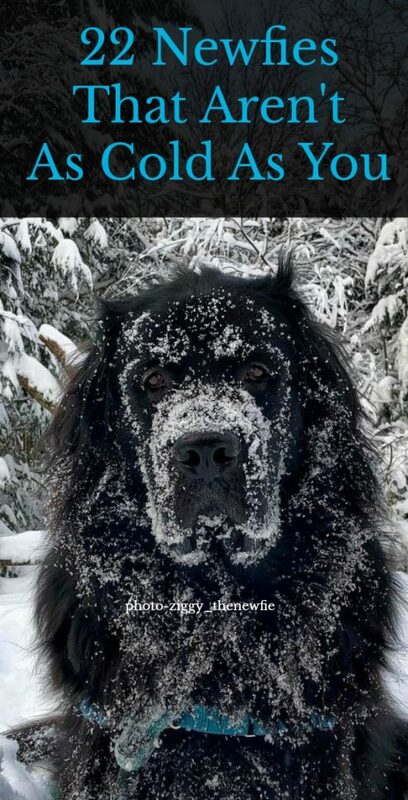 If you’re wondering how to tell if you’re Newfie is cold check out How Cold Is Too Cold For a Newfoundland. Thank you to all of our Instagram friends for amazing winter pictures! Go show them some love!